Is Joshua Ferris’s book the Catch-22 of Dentistry? 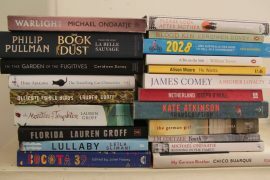 I am not sure whether I would have read To Rise Again at a Decent Hour by Joshua Ferris if it hadn’t made it to the long list of this year’s Man Booker prize. That is probably the greatest benefit of paying attention to literary line-ups of all hue – they lead you off in new directions. My failure to have previously zeroed in on this book or Ferris’s earlier novels, The Unnamed and Then We Came To An End, is a little strange seeing as both were very highly praised and Ferris was on the recent Top 40 Authors Under 40. Another list. Stephen King clearly acknowledges on the back cover how much he loved To Rise Again at a Decent Hour: “One hesitates to call it the Catch-22 of dentistry but it’s sort of in that ballpark”. However for the first third of the book it was like being stuck in a loop of endless Seinfeld re-runs. Sort of fun, but much ado about nothing. devotee of the Red Sox (the baseball team not footwear), who has developed a bit of a habit of falling madly, passionately, many would say obsessively, in love with the families of his Jewish girlfriends. Then his website gets hi-jacked, or to be more accurate, someone creates a website but hijack’s O’Rourke’s life to star on it. Soon O’Rourke has a Facebook and Twitter account plus a new email address. Only he doesn’t. And his unwanted alter ego is spouting some pretty incendiary stuff about religion. It doesn’t take O’Rourke (the real one) long to discover that on the Internet no-one hears you scream (or they hear but really don’t care) “No invention in the world, not the printing press or the telegraph, nor the post office or the telephone, had done more to get communicating than the Internet. But how did one person, the inaudible and insignificant single human voice, communicate with the Internet itself? To whom did it appeal an error? How did it seek redress?” Good question. As is “How well do you know yourself?” which the imposter fires back by email when O’Rourke (the real one) makes the big mistake and engages himself aka the imposter. Are you following? According to (the other) Paul O’Rourke, Paul O’Rourke (the real one) is descended from the ancient (and obscure) sect of the Ulm and needs to go back and embrace his roots to uncover and appreciate his real self. The good doctor goes through a number of stages of someone who finds themselves being impersonated by someone who isn’t them (are you following? ): angry, frustrated, intrigued, disbelieving, hopeful, envious. What’s more, other people see the tweets and website entries and find the writings of O’Rourke (the imposter, but they don’t know that) meaningful. They seek him (the real one) out. Even he (the real one) is impressed by himself (the imposter). And so on. I was hooked. To Rise Again at a Decent Hour is in parts very funny (Ferris does a superb one-liner), very sad, and strangely uplifting. There were a couple of bits where I went off with Alice right through the looking glass but Ferris is a unique voice and the book is well worth the bumpy ride. There was also an added, unexpected benefit. I am now meticulous about flossing. 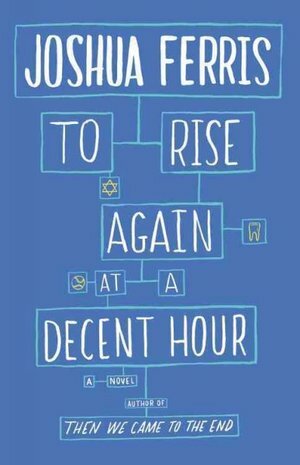 To Rise Again at a Decent Hour by Joshua Ferris is published by Penguin/Viking.